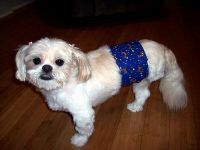 Our holiday fabric belly bands are made with 100% cotton and include a soft fiberfill inside. The Velcro closure is adjustable to your pups waist size and is available in 6 sizes ranging from Extra Small to Extra Extra Large. See "How to Measure" page for details. Attaching half of a human incontinent pad (i.e., Poise) to the belly band where it touches your boys` sheath area, will absorb the urine your pup releases. Toss the used pad and replace with a fresh one. Belly Bands are machine washable. Simply place in your washer with Velcro closed and select the delicate setting. For best results, when removing the belly band from the washer, stretch it a bit and hang to dry. If needed quickly, place in dryer on lowest setting as the fabric will shrink a bit.